Google Sites mobile landing pages. With Google Sites mobile landing pages, you can build a professional mobile landing page for your business in minutes, for free -- and without any coding experience. Choose from one of five templates for your site or start with a blank template. Choose a site name and URL. Give your site a description to make it easier for people to find. Choose whether you want your site to be visible to everyone or only certain people. Add text, images, buttons and gadgets to your site to help personalize it and deliver your message. 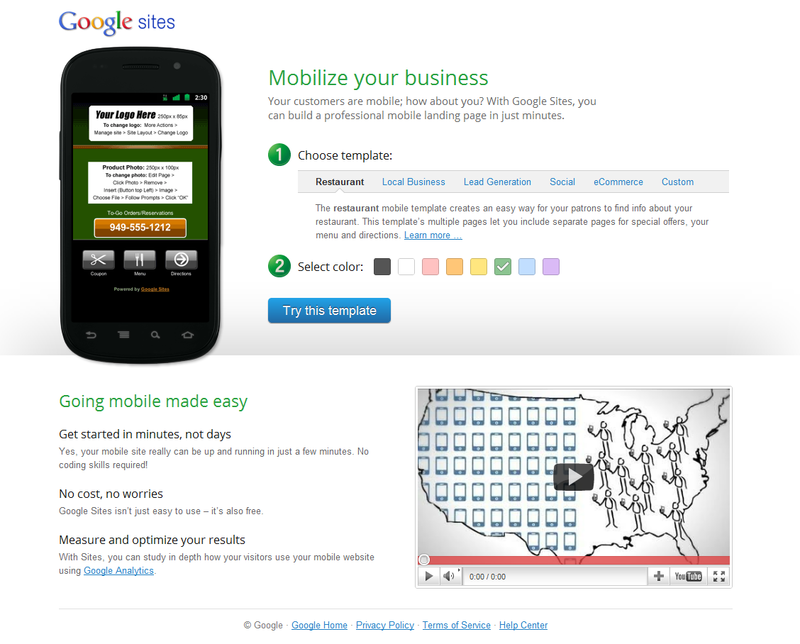 To get started, visit sites.google.com/mobilize, and see how going mobile can boost your business! By the end of this year, it is predicted that over half of all Americans will own a smartphone. With 51% of consumers more likely to purchase from retailers that have mobile-optimized sites, is your website ready to take on this growing mobile trend? We understand that time is the most valuable resource for a small business owner, so to help you save time, we’re launching a new tool: Google Sites mobile landing pages. With Google Sites mobile landing pages, you can build a professional mobile landing page for your business in minutes, for free -- and without any coding experience. Over the past six months, Google Places has ventured into Portland, Oregon; Austin, Texas; San Diego, California; and Madison, Wisconsin. Our goal for each of these campaigns was to celebrate the strong local business communities thriving in each of these cities. To do that, we’ve carried out a range of activities: hosted a bus tour to find the best barbecue in Austin, held a concert series showcasing some of Portland's favorite music venues, and met with thousands of small business owners to show them how Places can help them connect with customers. Our team has loved becoming a part of your local communities, connecting with small businesses and bringing Places users together. In the spirit of continuing that mission, we’re excited to introduce our new community city pages. Now you can get up to date info about all things Google happening in Portland, Austin, San Diego and Madison. On these sites, you'll be able to browse a list of some of the top businesses recommended by Portland locals by rating, by category ("Restaurant"), and by filter ("Family-Friendly"). Check back often as we'll be continuing to build out this list of places. And if you’re a business owner, we've got a special page just for you. Use it as your one-stop-shop to find out how to manage your presence on Google. Bonus: These pages have a fun set of video testimonials from small business owners using Places. We’ve got big plans for these pages, so stay tuned in the coming months to see what’s new. Nothing beats a good deal, and during these couple weeks we saw that first hand. We teamed up with Floyd’s Coffee Shop in Portland to launch the Google Offers beta, a new product that brings Portlanders daily deals from local businesses. On launch day, we asked Portlanders to sign up for our first deal: $3 for $10 worth of drinks and treats at Floyd’s, a local favorite. And you guys wasted no time! Starting at 7:30 a.m. the following morning, customers rolled in to Floyd’s to redeem and even scored Google Offers t-shirts. Since Floyd's, we've also had Offers at the Uptown Billiards Club, Karam Lebanese Cuisine and with Le Bistro Montage, Ground Kontrol and Mississippi Studios and Bar Bar. And there are plenty more awesome deals on the way — in Portland and soon in other cities. Subscribe to our e-mails at google.com/offers to learn more about new Portland deals, and to find out when we’re coming to your city. If you’re a business owner who wants to set up an offer, just send us a note. We’ve had an exciting first couple weeks, and we look forward to many more! Stay tuned to us on Twitter for more news and deals. Whether it’s to find a great place for dinner or to grab a cup of coffee, I often look up places directly on Google Maps. Evaluating my options and making a choice just got even easier thanks to the list of associated terms that now appears directly in the local search results. For example, if I’m looking for a place to relax and enjoy a great cup of coffee this weekend, I can see at a quick glance that Cafe Grumpy could be the perfect spot. Besides being known for their “latte” and “great coffee,” they have a “no laptop” policy — exactly what I was hoping for since I’d like to unplug and take a break from work this weekend. Or if I’m planning to visit friends on the west coast and need to organize a night out, Rose & Crown could be an excellent choice given their “great beer selection” and “trivia night” games on site! Whether you’re looking for local businesses in your neighborhood or in another city, these descriptive terms can help you find the places right for you. We hope you use these terms to discover new and interesting places on Google Maps, and watch for this feature to appear in Place search on Google.com and Google Maps for mobile soon! NYT Small Business Summit. The theme of the panel is ‘Decoding the New Digital Consumer’ and since I know you can’t all be in New York, I wanted to share a few thoughts more widely. We all know that online technologies have completely changed the way we find information. If I wanted to buy a new bike, for example, I’d visit a search engine to research my options and scour websites to educate myself on specific models. I might event visit YouTube to see bikes in action or check Twitter to see the latest announcements from certain bike manufacturers. When it’s time for a test ride, I would likely look up locations of stores and more information on my mobile device. Research your company. The first thing I tell any small business owner is to research your company online (yes, Google yourself! And also search on YouTube and Twitter...) to see where your customers are engaging with your brand. What are people saying about your company and where are they engaging on the web? Go local. One out of every five searches on Google.com is location-based. Verify your business address on Google Places so you can appear on Google.com and Google Maps. With Places, you’ll receive a monthly email with insights on how customers are interacting with your page. Talk to your customers. For businesses that fit well with two-way engagement (tip: not all do! ), Facebook, Twitter, and YouTube are all great channels for social interaction. You can ask for feedback, promote special offers to loyal customers, and even provide product education for zero to little cost BUT a significant effort can be required. Measure your efforts. Use a web analytics tool such as Google Analytics to understand your customers. With a simple piece of code, Analytics allows you to see which sites or search engines your customers visited before they arrived at your site. You can also see aggregated information on your customers’ geographic locations. So, for example, if you see a lot of visits coming from a certain city or state, you can target online ads to that region or make a special call out to these folks on your social media channels. The online world has really leveled the playing field. Now, small business owners can reach customers they would not have acquired when marketing was limited to expensive TV and print ad campaigns. I encourage you to spend time researching your online customers and some of you should consider building and interacting with an online community of customers and prospects. Without even spending a dime, you can build an online presence and potentially expand your customer base and your business. Next Monday I’m speaking on a panel at the NYT Small Business Summit. The theme of the panel is ‘Decoding the New Digital Consumer’ and since I know you can’t all be in New York, I wanted to share a few thoughts more widely.